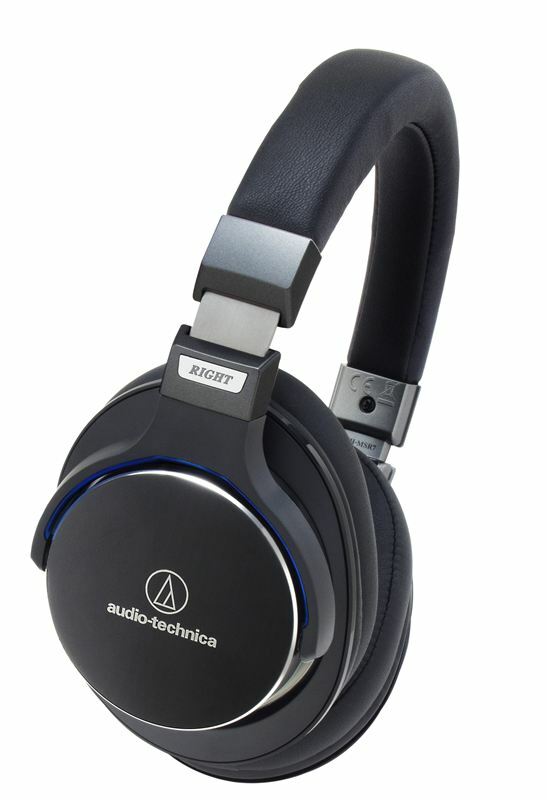 Every music fan can now experience Hi-Res audio in total comfort with the new Audio- Technica ATH-MSR7 headphones. Combining pro-grade sonic skills with the latest in premium design, these headphones model a discreet but stylish profile while boasting new audio technology, mastered by years of research though helping professional musicians and producers get the perfect sound since 1962. Designed for listening at home and on-the-go, the MSR7 headphones are the ultimate in comfort. Soft memory-foam ear pads fit securely and snugly around the ears, maximising comfort during long listening sessions, alongside Audio-Technica technology developed over 40-years of designing monitor headphones for producers, studios and musicians which minimises listener fatigue – crucial when enjoying new high resolution audio formats on the latest music players and smartphones. The housing has also been specially shaped with ear-profiled grills to ‘mirror’ the whole ear and enhance the rich, lower end sounds, while the highly flexible swivel design helps to find the most comfortable fit instantly. As you would expect from a company with a rich heritage in professional audio, the MSR7 headphones feature the latest audio innovations for the playback of next generation high resolution audio. At the core of the headphones are the 45mm “True Motion” Hi-Res Audio Drivers. Combining a precision diaphragm and extra light-weight voice-coil, response times are improved while sound distortion is minimised to deliver a smooth, rich and detailed audio presentation. To extend the mid to low frequency sounds, Dual-layer Air-Control Technology has been specially developed: housings made from an exclusive mixture of aluminium and magnesium are layered to provide a lightweight but rigid structure, reducing unwanted vibration that can taint the sound. Within this layered construction, a Triple-venting Acoustic Airflow design features three precisely placed ‘vents’ that control the air flow to give a much more dynamic sound. Whether listening to your favourite tracks on a home hi-fi, laptop or listening while on- the go, the MSR7 comes with cables to suit any situation: in addition to a standard 1.2 metre cable, Android and Apple fans listening on their mobile devices can connect a 1.2 metre iS cable, featuring in-line controls and a microphone. Incoming calls can be simply answered or terminated at the touch of button while songs can be paused without having to reach for your device. A 3.0 metre cable with a longer reach for listening at home is also provided. To keep the headphones pristine while in transit, a durable and robust carry case is also supplied. The Audio-Technica ATH-MSR7 is priced £199 (inc. VAT). Colours include Gun Metal (ATH-MSR7 GM) and Black (ATH-MSR7 BK). The AT-PHA100 Portable Headphone Amplifier is a smart addition to your desktop or commute. Engineered using select audio components, the AT-PHA100 gives headphones a rich, detailed boost throughout the sonic range with ultra-low distortion. Designed for use with PCs, Macs and portable devices, the AT-PHA100 is compatible with the latest high-resolution audio formats such as DSD and offers Hi-Fi performance without the need for a full size Hi-Fi system. The AT-PHA100 is the perfect partner for MSR7 and Hi-Res music downloads. The AT-PHA100 will cost £449 (inc. VAT).